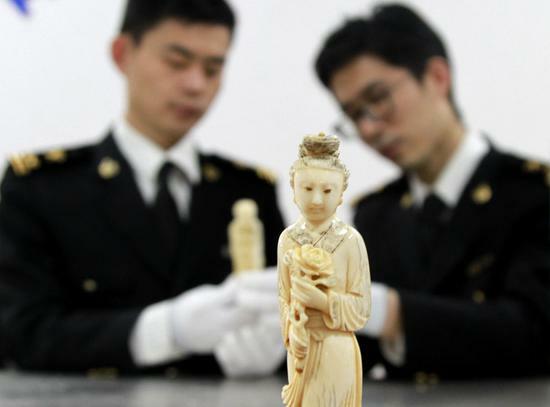 Chinese customs officers confiscated nearly 300 kilograms of ivory products in 22 cases from January to May, according to the General Administration of Customs on Wednesday. The administration and other authorities, including public security and forestry departments, launched a campaign in January targeting smugglers of endangered species and wildlife products, drugs and firearms. “The punishment of such crimes demonstrates the government’s firm resolve to protect the environment, conserve wildlife and combat the illegal trade in wildlife products, including ivory,” said Zhang Guangzhi, spokesman for the General Administration of Customs. From January to May customs officers cracked 84 cases involving the trafficking of endangered animals and plants, and their products. They also confiscated 281 kg of smuggled ivory products. Most of the seized ivory products were smuggled from Africa, either in travelers’ luggage or through the mail. In recent years, the number of cases of ivory trafficking has risen because many wealthy Chinese people have a strong desire to collect ivory and carved art. According to the administration, suspects in China colluded with accomplices in Africa to smuggle ivory artworks and sell them on the black market. Since January, China has stepped up its efforts to fight the illegal trading of endangered species and wildlife products. According to customs, inspections have been enhanced to block the illegal movement of wildlife products and endangered plants through various transportation channels, mail and express delivery companies. Moreover, the authorities have paid more attention to monitoring websites to combat illegal online trading and have closely watched suspicious bank accounts, they said. Figures released by customs show that from January to May, officers investigated 1,613 smuggling cases, including those involving endangered species, illegal wildlife products, drugs and firearms. The amount of money involved reached more than 20 billion yuan ($3.13 billion).